Nine Lives is already well on its way to becoming a historic watermark in musical theater; there are few better indicators of the ongoing revival in the city’s music scene. On Saturday night, Paul Sanchez stood at the back of the Ellis Marsalis Center for Music, watching “Nine Lives” come to life. Over the past two years, Sanchez, his collaborators and benefactors have raised and spent more than $150,000 to transform “Nine Lives,” New Yorker staff writer Dan Baum’s best-selling 2009 chronicle of nine New Orleanians between hurricanes Betsy and Katrina, into a “concept cast album” and, maybe, a musical. Next Monday, June 20th, Sixth and I will showcase Nine Lives, The Musical Adaptation, a concert which follows the stories depicted in the novel Nine Lives by Dan Baum. Nine Lives tells the stories of nine individuals in New Orleans during the time period between Hurricanes Betsy and Katrina in 1965 and 2005, respectively. Singer/Songwriter Paul Sanchez wrote music for the concert along with Colman DeKay, and Sanchez is joined by author Dan Baum and all-stars Tony Award-winning actorMichael Cerveris (Sweeney Todd, Assassins), and musicianArsene Delay to bring these stories to life next week. The Vinyl District was lucky enough to catch an interview with Paul Sanchez in anticipation of the show. They started as fans unusually proactive fans from all over the world who met online through their shared love for New Orleans music. They wound up starting an unusual record label serving many of the city's best musicians. He’s had a fabulous year. and you’re their king at Mardi Gras. There's a bit of the performer in most politicians -- some more than others. Harry Connick Sr., the city's former district attorney, has frequently moonlighted as a nightclub crooner, albeit to smaller crowds than his much more famous son. Former City Councilman Oliver Thomas is currently starring in a play. And there's Frank Minyard, the trumpet-playing coroner. 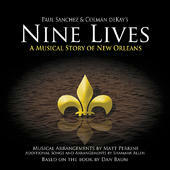 Mayor Mitch Landrieu, who took singing lessons and contemplated a stage career as a young man, is the latest elected official to take to the spotlight, appearing on a CD compilation of original songs by Paul Sanchez and Colman deKay titled "Nine Lives: A Musical Adaptation." New Orleans' musical renaissance, so well documented in the HBO series Treme, has reached its apotheosis with this expansive project. Paul Sanchez, a versatile singer-songwriter who performs in dozens of different contexts around New Orleans with many of his cohorts, joined forces with lyricist Colman deKay and several local musician buddies to write forty songs based on Dan Baum's best selling novel, Nine Lives. Sanchez then enlisted over 100 musicians to realize this dream, and they took this three-ring circus into Piety Street Studios, where Sanchez - abetted by engineer Wes Fontenot and resident master of mixology Mark Bingham - proved an able ringmaster. Lots of authors dream of their books scoring glowing praise from theNew York Review of Books, topping the bestseller lists, getting optioned for a Hollywood movie. But getting turned into a musical? How often does that happen? That could be the fate for Nine Lives, a nonfiction account of New Orleans penned by Boulder-based writer Dan Baum. A group of New Orleans musicians recently scored $50,000 from the Pepsi Refresh Project, a contest funding revitalization projects around the Gulf to make an album based on the characters and stories in Baum's book -- the first step towards a full Broadway musical. his debut performance at the Provincetown Jazz Festival. But then the gulf oil spill happened. people can rebuild from. It will kill the wildlife and put thousands of people out of work. It will last. Shamarr Allen is a born front man, the kind of artist who embraces a showy star turn. Throughout his career performing and recording with brass bands, jazz ensembles, and his recent funk-rock projects, listening to Allen perform has meant hearing his sensibilities and his powerful trumpet drive a band’s rhythms and shape its sound. 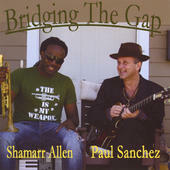 On Bridging the Gap, his collaboration with veteran New Orleans singer-songwriter Paul Sanchez, Allen’s charismatic musical presence is uncharacteristically subdued. I met Shamarr at an in-store in Louisiana Music Factory Jazz Fest 2006. I was still with the Mouth and he was still with Rebirth. They were playing after the Mouth set, and during our set I sang Randy Newman’s “Louisiana, 1927,” and Shamarr got up and joined me on that song. I said into the mic, “I don’t know who that young trumpet player is but that was beautiful.” I asked him to play on Exit to Mystery Street and hired him for as many gigs as I could. This wrenching adaptation of journalist Dan Baum's book about nine intersecting New Orleanian lives spanning Hurricane Betsy through Katrina represents the sound of the city in a way that's never been tried before. Screenwriter Colman deKay teamed up with former Cowboy Mouth front man Paul Sanchez (and on many tracks John Boutte') to retell the story.